This past summer as our family was making the transition from NC to Kennett Square, PA Joseph, (or Joe as the rest of the world has come to call him) was beginning his journey to NC State. As we pulled away from an empty home and started off on our new adventure we were aware that one of the members of our “tribe” was not going with us. When NC State started a few weeks later Joseph and one of his friends from high school packed up and headed off on their own adventure…glad to be on their own. Let me share with you a couple of things about “Joe” or Joseph Richard Nicewonger. He is named after my maternal grandfather, Joseph Entrikin, who was one of the most special and unique men I have known my entire life. Joseph Entrikin knew what a hard days work was. He also knew how to relax and enjoy himself, whether fishing, hunting ducks or simply spending time with those he loved. He understood “who he was and whose he was” and that understanding drove every decision he made in life. The memory of my grandfather which remains burned into my mind is of him sitting in his special chair in the corner of the living room on Delsi drive every morning reading his bible. Both my grandfather’s chair and his Bible have a special place in my living room today, constant reminders of the example that was laid before me of what it meant to live life well. Joseph Richard Nicewonger also carries my father’s name. Richard Nicewonger (or Dad as I have come to call him these last 46 years) is a man whose life is guided by his faith in God and his belief that through a little hard work (or a lot if you are 10 years old picking rocks out of the garden in upstate NY) you can make any difficult situation better. He worked his way through high school helping to provide for his family. After time in the Navy he worked his way through college and then his masters degree. I think it is fair to say that I have never seen my Dad back down from a challenge, he has worked his way through it…even the most difficult and painful ones. Working side by side with Richard “Dad” I learned what it meant to set a goal, figure out a plan of attack and then work until you accomplished the goal. I also learned that there are priorities…the biggest being all work and projects stop on Sunday. As important as the work and progress are…it is more important to take time to give praise to the One who gives us the “tools and talents” to work. Sabbath rest, time with God and family always took priority above the project…no matter how big or how important. 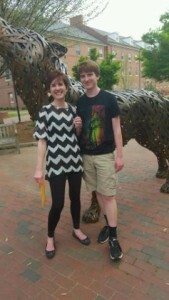 Nancy and Joseph at NC State – Who is this guy? At this point you may be thinking, “What are you sharing about your son?” “Dan, you may have slipped the rail here…this has nothing to do with Joseph Richard Nicewonger.” Technically you may be correct…but my son, Joseph Richard Nicewonger, has adopted the best of what each of these two men had to offer him. 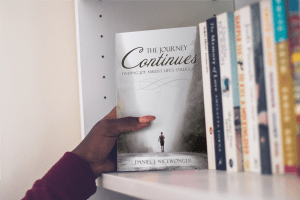 There came a time when Joseph had a choice to make, he could pick up or cast aside the wisdom and truth these two namesakes had to offer him. As Joe weaves his way through this first year of college he has been confronted with challenges that are new to him. He has responded like his grandfather Richard and figured out how to work harder, smarter and has continued on until difficulty has been overcome and victory achieved. This past week as he spent time with Nancy, touring her around campus, introducing her to everyone I was reminded of his great grandfather Joseph and how he lived life so well. When Joseph was in his early teens he came and asked to be baptized. Part of our practice is for people to pick a “life verse”, something that has a special meaning for them. He chose Luke 2:52 “And Jesus grew in wisdom and stature, and in favor with God and men.” I remember listening to Joseph talk about his desire to grow and mature in all areas of life. I remember responding by simply praying that God would honor his request. May God continue the good work he has begun in you, my son!